The horrifying concept of nuclear winter emerged over thirty years ago when scientists studied the ecological after effects of nuclear war and found that surviving the initial nuclear blast would be worse than originally perishing in it. The research indicated that detonation of not one but many nuclear weapons could transform a warm, living Earth into a dark, cold, dying Earth for possibly more than 20 years following a large-scale nuclear conflict. Because the detonation of several large nuclear weapons would catapult immense amounts of dust and ash into the atmosphere, the idea that a "wall" of soot would settle in between the sun and Earth, effectively inhibiting sufficient levels of sunlight from reaching the ground to induce photosynthesis. Combine this with a significant drop in temperatures and the ensuing scenario presents a grim picture of what survivors of a nuclear war would suffer. At least five millions tons of ash and dust would be discharged from 50 nuclear bombs similar to the ones dropped on Hiroshima. An immediate drop in temperatures as much as ten degrees Fahrenheit could occur, directly affecting crop growth. Smoke from uncontrolled burning in urban areas would rise to the upper stratosphere and remain in place for years, delaying the ability of the ozone layer to self-repair. To some people, perishing within days of a nuclear war is preferable to attempting to survive the catastrophic conditions following such a cataclysmic event. 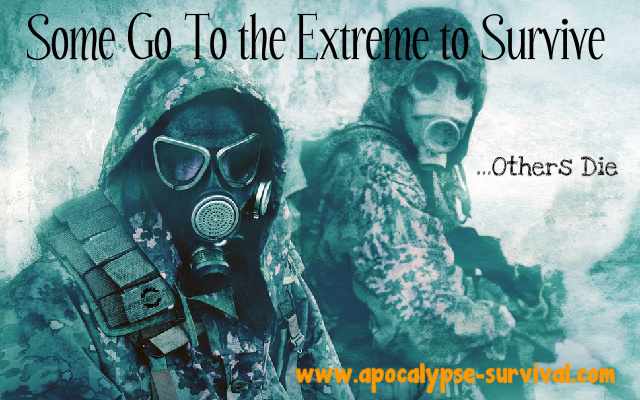 This is why preparing for the possibility of nuclear devastation is essential for providing you and your loved ones with adequate shelter and indispensable items that greatly increase your chances for survival. Because of widespread food and water shortages, people will be desperate and exhibit less than ethical behavior when attempting to find food. Protecting your shelter and supplies with force if necessary will be a top priority. Establishing a well-safeguarded compound surrounded by sturdy fencing, solar and wind-powered surveillance cameras and stocked with an effective arsenal will unfortunately be just one aspect of the bleak reality facing those trying to survive the aftermath of nuclear war. Decreasing temperatures because of winter type nuclear dust means having enough warm clothing and sufficient heat resources to survive the mini "ice age" expected to develop following nuclear bomb detonations. Since electricity, oil and gas will be practically impossible to obtain, alternative energy sources such as wood and biomass will need to be implemented into your shelter's power system. Keeping as much food stocked in your shelter as possible, especially dehydrated and freeze-dried long-term-storage food that stores well, is another practice essential to surviving a nuclear disaster. Disease and sickness will be rampant following a nuclear war. Depletion of sanitation supplies like bleach, hydrogen peroxide, rubbing alcohol and antibacterial soap will occur within weeks of the disaster. Without them, proliferation of harmful microorganisms and the diseases they cause, in addition to radiation sickness, will cause millions of deaths. Protecting yourself against toxic bacteria and viruses will be nearly impossible without cleaning supplies. The people surviving a nuclear winter long enough for the atmosphere to clear and allow sunlight to reach the ground will be subjected to powerful amounts of ultraviolet rays that have not been minimized by the ozone layer. As a result, severe skin burning and melanoma incidences will present an immediate danger, as well as internal organ damage caused by high radiation. Wearing generous layers of sunscreen or protective clothing whenever venturing outside will be necessary to avoid these health issues-- if and when the ozone layer reforms.